On 23 July 2015, Kenya submitted its Intended Nationally Determined Contribution (INDC) to the UNFCCC secretariat in which it seeks to abate its greenhouse gas (ghg) emissions by 30% by 2030 relative to the business as usual (BAU) scenario of 143 MtCO2eq (GoK 2015). Kenya largely ascribes to the ghg atmospheric concentration stabilization levels endorsed by the Intergovernmental Panel on Climate Change (IPCC), the scientific advisory arm of the UNFCCC. Its INDC notes that “in order to meet the below 2oC objective, all countries will need to undertake mitigation based on the common but differentiated responsibilities and respective capabilities in accordance with the Convention” (GoK 2015, pg. 6). Kenya’s National Climate Change Response Strategy (NCCRS) makes reference to Article 2 of the UNFCCC as calling on world governments to take action aimed at reducing and stabilizing atmospheric concentrations of GHGs “at a level that would avoid dangerous anthropogenic interference with the climate system”’ (GoK, 2010a, p23). It also refers to the Copenhagen Accord as having adopted ‘the widely accepted scientific view that global temperature increase by 2100 should not exceed 2°C, which is considered the safe upper limit’ (ibid. p26). Nevertheless, the NCCRS stress that many are of the opinion that the reduction targets under the Copenhagen Accord are still likely to overshoot the global average temperature increase beyond the desired 2°C, and is cognizant of the fact that some climate models show that the current emissions pathway leads us to a much warmer world of 3°C and upward. In short, while Kenya’s efforts, both domestic and globally in cooperation with other nations, are geared towards attaining the ‘widely accepted’ global atmospheric stabilization level of not more than 2°C rise in temperatures, it is aware that this might not be adequate, and suggests that much more, beyond the Copenhagen Accord reduction targets and pledges, should be done. Kenya therefore hopes that its ghg emission reduction target indicated in its INDC will contribute to achievement of the 2°C atmospheric ghg concentration or even less warming, but only if other countries commit to reduce their emissions based on a serious consideration of their historical and current ghg emissions. Section 3 of the INDC titled Fairness and ambition states: “Kenya believes that the key factors in determining the fairness of a contribution should include historical responsibility and respective capability to address climate change” (GoK 2015, pg.6, emphasis added). This is a clear expression of what guides Kenya’s consideration of ethics, justice and equity in setting its ghg emission reduction targets. The INDC notes that Kenya’s historical and current contribution to global ghg emissions is minimal, yet it is bearing the brunt of climate change impacts and the associated socio-economic losses, a situation exacerbated by its high dependence on climate sensitive natural resources. The INDC, while admitting that its ability to act on climate change is limited by high levels of poverty and the need for economic growth, it reiterates the UNFCCC’s recognition that the extent to which developing countries will meet their obligations is dependent on their capabilities and level of international support. Moreover, the INDC is categorical that in order to meet the below 2oC objective, all countries will need to undertake mitigation based on the principle of common but differentiated responsibilities and respective capabilities as outlined in Article 3(1) of the UNFCCC. The NCCRS is critical of the Copenhagen Accord as having omitted the clause relating to ‘historical responsibility’, terming this ‘a great violation of one of the key principles of the UNFCCC’ (GoK, 2010a). Nevertheless, it argues that ‘it is perhaps a good move forward in trying to find a solution to the climate crisis. This is because current climate science tells us that much more (in terms of mitigation) still needs to be done if we are to escape the worst effects of climate change; hence the compelling need to involve both developed and developing countries in mitigation’ (GoK, 2010a, p26). This demonstrates the country’s selfless and strong view of its own ethical obligations to play its part in safeguarding the climate system no matter the historical responsibility of the developed countries. It also underscores the country’s view that reducing global ghg emissions requires a global partnership between both developed and developing countries, whether these are binding or voluntary. The Action Plan sees the ghg emission reductions as also “… demonstrat(ing) Kenya’s leadership in the global fight against climate change” (GoK, 2013, p63). In a nutshell, because of its negligible historical contribution to global ghg emissions, low current per capita emissions, serious vulnerability to climate change, high poverty levels and low adaptive capacity, Kenya views its ghg reduction target as representing its fair share of safe global emissions. The country has explicitly stated so in its INDC, and the same is implied in the NCCRS and National Climate Change Action Plan (NCCAP) (GoK 2012). (1) Kenya considers historical responsibility and respective capabilities as important considerations in determining a fair share of safe global emissions. (2) The mitigation actions it seeks to undertake are aimed at contributing to economic growth and development of its citizens, a majority of whom are poor and very vulnerable to climate change, as well as others beyond its jurisdiction. (3) It has committed to undertake emissions reduction actions no matter its historical or current contribution, underscores that all countries should act even if they are not legally obliged to do so under the UNFCCC, and seek to demonstrate global leadership in the fight against climate change well aware that the eventual beneficiaries are those most vulnerable to climate change wherever they may be, and future generations. (4) By claiming financial, technological, and capacity support from developed countries which bears significant historical responsibility, Kenya is, by implication, ensuring that the Annex I countries acknowledge and honour their own ethical obligations to reduce emissions and support those most vulnerable to climate change. Because the INDCs were only recently submitted to the UNFCCC, not much time has as yet been available for NGOs and other parties to engage with the INDC. Nevertheless, the Pan African Climate Justice Alliance (PACJA) which had produced a handbook to support African practitioners draw up their climate action plans, including guidance on how to reinforce an equitable global deal which caters for the needs of Africa’s people suffering the impacts of climate change, offered its opinion in a piece titled “Kenya’s INDC: Does it go far enough?” (PACJA 2015). They note that instead of taking the African civil society’s position of keeping the global temperature target well below 1.5oC, the Kenyan INDC chose the 2oC limit. Other ‘missed opportunities’ are non-inclusion of ‘general conditions’ such as requesting that developed countries make mitigation, adaptation, finance technology development and transfer commitments in the pre-2020 period; lack of specific measures to address unequal energy access within Kenya; and non-consideration of loss and damage are considered missed opportunities. More generally, Human Rights Watch (2015) have called on the Kenyan government to ensure that the National Adaptation Plan under development and climate change policies in general are in accordance with Kenya’s obligations under the UNFCCC and international human rights law that includes plans on how to protect rights to food, security, water, and health. They should also identify how climate change will affect enjoyment of specific rights and include implementation strategies to reduce the burden of those effects, particularly on indigenous people and marginalized groups, including women, children and persons with disabilities. The Kenyan media has not adequately covered the INDC itself, let alone focus on and analyze how ethical, justice and equity issues have been addressed. Little reference to and interrogation of the INDC has appeared in the media since it publication. Kenya’s INDC is quite explicit that the ghg emission reduction target is in line with its economic and development agenda as outlined in Vision 2030 in which it strives to be a newly industrialized middle income country by 2030. Perhaps this is why the 30% ghg emission reduction target is similarly set to be achieved in 2030 when the Vision expires. Pursuit of this development goal is expected to increase emissions. But the country is also aware that it is already bearing the brunt of climate change impacts and the associated socio-economic losses, a situation exacerbated by its high dependence on climate sensitive natural resources for economic development (e.g. rain-fed agriculture, energy sources, tourism etc). Most of the country’s landmass is arid and semi-arid land (ASAL) with poor infrastructure and other developmental challenges. Climate change impacts are therefore expected to slow down the attainment of national development goals. Kenya thus sees its ghg abatement targets as a balancing act between economic development on the one hand and contributing to global efforts to mitigate climate change whose impacts are already slowing down the rate of its economic development. Mitigation efforts at the 30% abatement are viewed as supporting its development agenda rather than being against it. The strongest and most commonly used formal mechanisms through which Kenyan citizens, NGOs and other interested organizations can get involved in and question the country’s ethical, or indeed any other, position on climate change is the 2010 Constitution. Public participation is one of the national values and principles of governance enshrined in Article 10 of the Kenyan Constitution. It binds all state organs, public officers and all persons to observe this principle whenever they enact, apply or interpret any law, or make or implement public policy decisions (GoK, 2010b). The Kenyan courts have, in several instances, declared null and void public policy decisions made without respecting this public participation principle (see, for example, Kenya Law, 2014). Operationalization of this constitutional public participation provision often takes different forms depending on the particular policy, ministry, or institution in charge of the process. For example, in the formulation of the National Climate Change Response Strategy, stakeholder consultations and workshops organized by the Ministry of Environment and Mineral Resources were held throughout the country whereby individuals, CSOs and other interested parties gave their input. The Action Plan was guided by the technical input of a cross-sectoral Climate Change Taskforce which was comprised of representatives from relevant government agencies, CSOs, academia and the private sector, while many individuals participated in a large number of consultations held throughout the country. A similar process was followed in preparation of the draft Climate Change Authority Bill 2012. Kenya’s INDC states that it builds on the participatory multi-stakeholder and cross-sectoral consultative processes followed during the development of NCCRS and NCCAP at national and county levels. The 2010 Kenyan Constitution introduced a devolved system of government whereby there are two separate and distinct levels of government: national and county. The County Governments Act 2012 requires county governments to make their development plans in a manner that aligns national and county government policies. Environment and climate change is a function of both the national and county governments and requires concurrent jurisdiction across both levels. According to the National Climate Change Action Plan, counties are to develop their own climate change policies, legislation and action plans in line with the national policies and legislation. Because the counties only became operational after the general election in 2013, many counties are yet to or are still in the process of developing their climate change policies and laws. However, when they finally do so, it is highly likely that they will follow the ethical responsibility or position taken by the national government as already outlined in the earlier questions of this report. The Kenyan government subscribes to the notion that all nations, no matter their historical or current responsibility for ghg emissions, have an ethical and moral duty to safeguard the climate system for the benefit of current and future generations, based on their capacity, as encapsulated in Article 3(1) of the UNFCCC. Moreover, mitigation interventions are viewed as beneficial to the sustainable development of the country (for example, promotion of energy efficiency and renewable energy technologies, tree planting, and so on). To operationalize this principle, the Kenyan government in its National Climate Change Response Strategy (NCCRS) and National Climate Change Action Plan (NCCAP) identifies several actions which stakeholders in various sectors should undertake to reduce ghg emissions. Their implementation includes proposals, suggestions, directions and encouragement to various stakeholders to act to reduce their ghg emissions. • There is need to actively think through and expressly state or explain their understanding of and position on why and how to integrate ethics and justice into the formulation of climate change policies. This will make it easier to better evaluate the policies in terms of their achievement of such ethics and justice objectives. • In line with the preceding point, concerted and targeted capacity-building and awareness creation efforts on climate justice and ethics should be initiated, especially for decision-makers at both national and county levels. The civil society which is more erudite in this area can play a significant role in raising the profile of ethics and justice issues and advocating their mainstreaming into government policies. • More focus should be put on the lateral (horizontal) dimension of ethics and justice without, of course, neglecting the vertical dimension. So far, and understandably so, more emphasis seems to have been put on the vertical dimension (a North–South/developed–developing countries perspective). There is need to ensure that climate change policies target and actually benefit the majority poor and vulnerable within Kenyan society rather than the few rich, elite, and/or gatekeepers. The trickle-down effect of international funds to the very poor and vulnerable is still wanting. Corruption but also genuine capacity challenges remain key bottlenecks. Developing countries should foster South–South partnerships, especially in the areas of knowledge sharing and technology transfer or exchange. Concepts such as Ubuntu (humanity to others) should find more expression and utilization in climate change management. 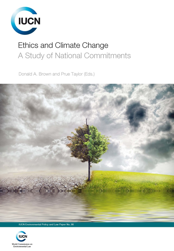 • More research ought to be carried out, especially on different global cultural/anthropological understandings and operationalization of the concepts of ethics and justice, and their application to climate change negotiations and management. While Western understandings of ethics and justice seem to dominate global climate change governance, a plurality of epistemologies would enrich the discourse. Pan-African Climate Justice Allianece [PACJA] (2015) ‘Kenya’s INDC: Does it go far enough?’ http://www.pacja.org/index.php/en/media-information-centre/road-to-paris/834-kenya-s-climate-action-plan-does-it-go-far-enough, accessed 16 October 2015.